The kidneys are the organs that filter wastes out of your blood to produce urine. They?re located near your back muscles, which is why kidney pain is often misinterpreted as a back injury. You?ll usually feel kidney pain in your side or upper back. It can feel sharp, or like a dull ache. Often, kidney pain is accompanied by symptoms like fever or trouble with urination. 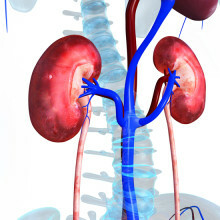 A number of different conditions can cause kidney pain. Kidney stones are clusters of substances such as calcium and oxalate that build up and form hard masses. 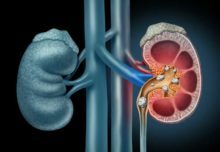 Stones typically don?t cause symptoms while they?re in your kidneys, but when they try to exit through the narrow ureters, the pain can become intense. Pain from a kidney stone is called renal colic. Bacteria can get into the kidneys and cause a type of urinary tract infection called pyelonephritis. Along with kidney pain, you?ll notice other symptoms of an infection, such as fever and chills. Urination may also be painful. Polycystic kidney disease is an inherited condition that causes fluid-filled sacs, called cysts, to form in the kidneys. Symptoms often don?t appear until the cysts have grown quite large. Kidney pain and pain in the sides are common with polycystic kidney disease. Cancer can form in your kidneys, just as it does in other organs. Besides kidney pain, symptoms of kidney cancer include blood in the urine, weight loss, and fatigue. Other conditions that can cause kidney pain include blood clots (renal vein thrombosis), bleeding (hemorrhage) in the kidneys, or swelling caused by a backup of urine in the kidneys (hydronephrosis). Call a doctor if you experience kidney pain, particularly if you also have symptoms like fever or blood in your urine. Tests can determine the source of the pain, and help your doctor find the right treatment. What’s Causing Your Middle Back Pain?